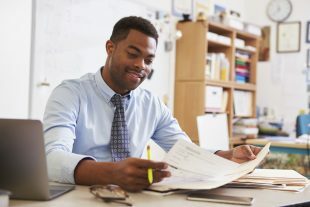 The Mirror has published a misleading story claiming that statistics show a high proportion of trainee teachers don’t have an A or AS level in the subject they are training to teach. The story is based on statistics we published last week that provide data on the performance of individual initial teacher training routes for the academic year 2014/15. The Mirror’s story uses analysis from the Labour Party that only looks at undergraduate data - a tiny proportion of trainee teachers. This completely distorts the real picture of the teaching landscape as the vast majority of trainees are postgraduates. The quality of entrants to initial teacher training continues to be high, with a record proportion of those in postgraduate teacher training in 2015/16 holding a first-class degree. In fact, 97.3% of all teachers have a degree and more than 70% of lessons in maths, English, science subjects, geography, French and German are taught by teachers with high level qualifications in the relevant subjects. continuing to offer generous bursaries and scholarships for trainees in maths and science teachers. investing £67 million to transform science, technology, engineering and maths teaching in England by recruiting up to 2,500 additional maths and physics teachers, and providing subject knowledge training to 15,000 non-specialist serving teachers. actively supporting schools to encourage former experienced teachers to return to the classroom. ensuring schools have more involvement in teacher training, through school based training routes like School Direct – meaning headteachers can be sure their new teachers have the knowledge and skills that are needed to be successful in the classroom. These figures are misleading. Undergraduate teacher trainees represents a very small proportion of the overall cohort, with the vast majority of entrants holding a degree. The quality of those trainees continues to be high. A record proportion – 18 per cent – of those in postgraduate teacher training in 2015/16 held a first-class degree. Recent statistics show that more than 70% of lessons in maths, English, science subjects, geography, French and German are taught by teachers with relevant post A level qualifications. Find out more about how you can get into teaching.